John’s interest in radio began in his teens and he held an artificial aerial licence 2AOV which he had held since June 1936. He upgraded to G3AH in 1937 and made his first contact in November that year. He joined the Civilian Wireless Reserve and became one of the Early Birds, being stationed in France within days of Germany invading Poland (see link below for John’s own story). John was at Biggin Hill during the Battle of Britain, where he shared accommodation with Bob Lever, (G)2DXU, a relative of Alan Wyatt’s. John made contact with Alan in 2011 and they corresponded by email. John was made an Honourary Life Member of RARC in 2012 when he allowed Alan to register his 1937 callsign G3AH in the Club’s name. John had 380 confirmed CW DXCCs. This entry was posted in Amateur Radio, CW, In Memorium, Silent Key and tagged G3AH, John D. Wightman, RAF, silent key, WW2, ZL1AH on 14/12/2017 by G2DXU. We are pleased to announce that Riviera ARC has a new club callsign – GX3AH will join our existing callsign MX0RIV – and would we like to take this opportunity to thank John D. Wightman ZL1AH for making this possible. John was assigned G3AH in November 1937 after taking the Morse test and upgrading from his ‘artificial aerial’ licence 2AOV which he had held since June 1936. Less than two years after first getting G3AH on air, World War 2 put a stop to amateur radio activities, though some young hams found a new role. After volunteering to become part of the Civilian Wireless Reserve (CWR) in response to the appeal by the RSGB, John ended up in France with the RAF within 3 days of war being declared. John’s story about the Civilian Wireless Reserve, nicknamed “Early Birds” by the RSGB makes fascinating reading. 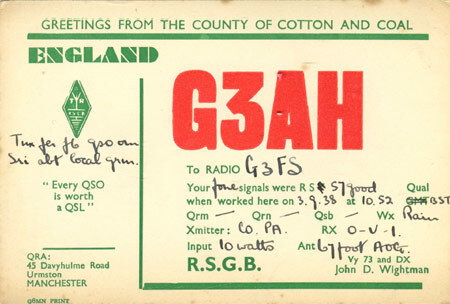 After hostilities ceased, G3AH was back on air, but then John moved to New Zealand in 1950 and G3AH became silent, except for a brief airing in 1974 when he visited England again. John has been active in amateur radio for 76 years and has 370 confirmed ‘DXCC entities’. During service in the RAF in WW2, John met Bob Lever 2DXU. Bob’s callsign was upgraded to G2DXU in 1946 and is now held by RARC Secretary Alan Wyatt. GX3AH with the ‘X’ signifying that the callsign is that of an English club, will be active again almost 75 years after first being heard on the airwaves. This entry was posted in Riviera ARC and tagged 2AOV, 2DXU, artificial aerial, Bob Lever, Early Birds, G2DXU, G3AH, G3AH QSL card, GX3AH, John D. Wightman, RAF, RAFARS, RSGB, WW2 on 21/06/2012 by G2DXU.